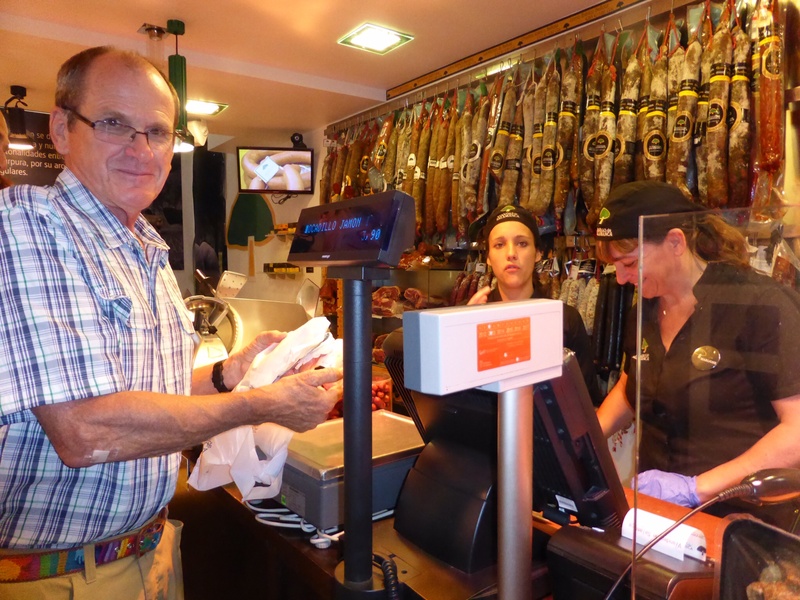 Rod has found the ultimate meat sausage store! This is the scene at 9 pm, the restaurants so full that people are sitting on the streets to eat and it is standing room everywhere in front of every bar. What is amazing is that the waiters can remember every item when adding up your tab! 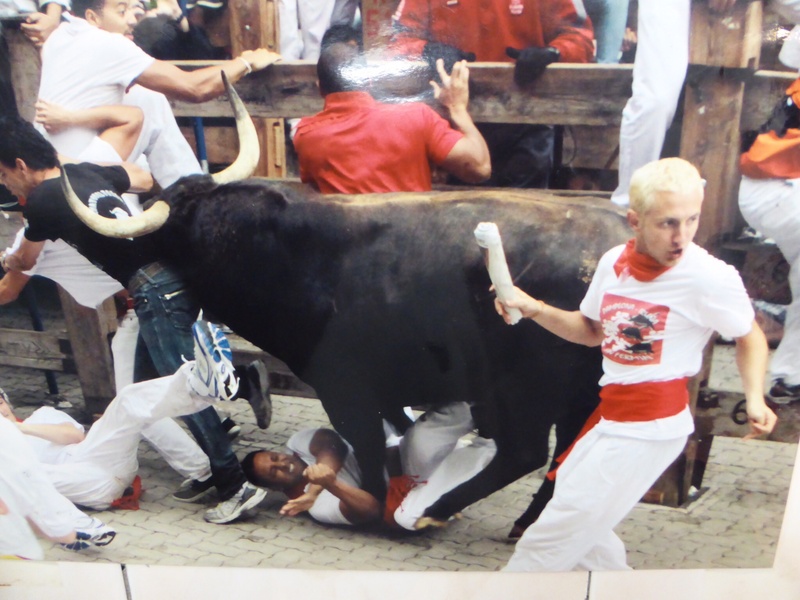 A photo in a coffee shop of last years Running of the Bulls… No thanks! Pamplona,is the largest city in the Navarre region of Spain. It was built by the Romans (74BC) on the site of the Basque village of Iruna and is named after General Pompey. Pamplona was a series of walled areas within a walled city as the Basque, Frank, and Jewish populations could not get along. The fortifications were completed in the 16th century and the inner walls were finally dismantled in the 19th century. Pamplona is now a lovely city of wide streets, many squares where people gather, green spaces and parks for children. There are numerous cathedrals, a grand citadel and city hall representing a mixture of Roman, Gothic and Neo-Classical architecture. We toured the town but only scratched the surface of it. It is a festive place and comes alive in the evenings. People spill out of the bars and restaurants. It is almost like a block party and the camaraderie is palpable. 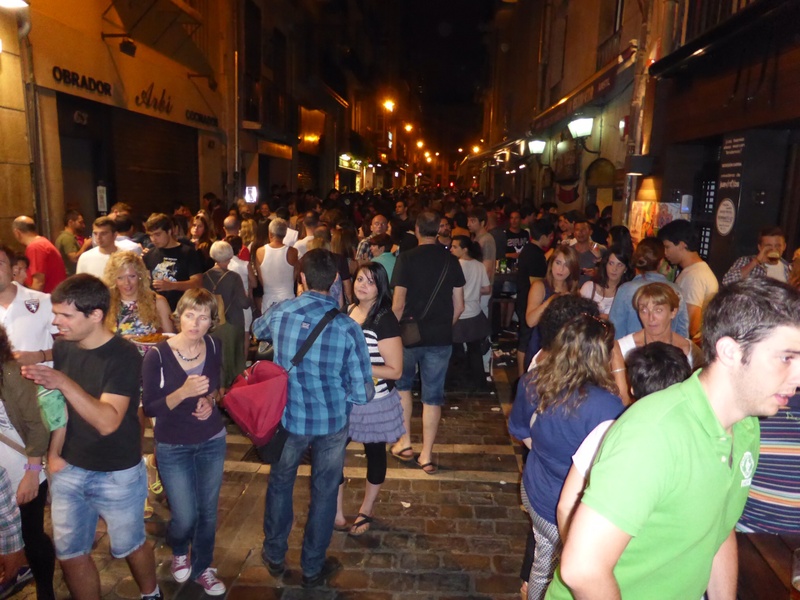 There is not enough seating so people stand or sit in the cobblestones and enjoy their vino and tapas ( “pintxos” in Basque). The pintxos are usually a bread or bun base with cheeses, meat, seafood and toppings we do not recognize piled on 3-4 inches high! They are amazing and 2 make a meal. Needless to say, Dad loves them. I stick to the ensalata which is always good. 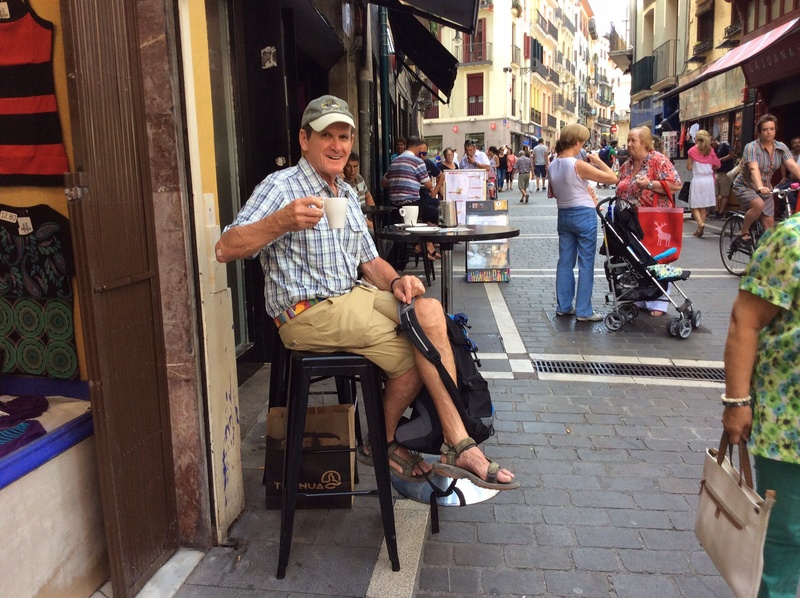 Since Bayonne we have been travelling in the Basque country of France and Spain. The Basques claim to be the descendants of the first Europeans. They have their own language, customs, flag and coat of arms. Politically they are active but from what we have been told do not have a large following. Their violent actions have worked against them, it seems. However, signs are in Spanish and Basque and the languages are not at all similar. It is interesting that very few at hotels, shops and restaurants speak English. This is probably not the case in bigger cities or with young people. We cannot leave Pamplona without mentioning the “Running of the Bulls”. It is not on now:-) However, the “encierro” is a major part of the Festival San Fermin, patron saint of Navarre and is held the 2nd week in July. The many young men we saw on crutches are all that remain of this year’s encierro.